Baptism is a momentous event in an Amish person’s life. It is a commitment made with the church body to God. Baptism in the Amish church has lifelong implications for one’s religious and social life. Thus the decision to become Amish is not taken lightly. Why do Amish believe in adult baptism? Baptism was as a fundamental issue in the founding of the Anabaptist movement. The issue of infant baptism was crucial for early Anabaptists, who believed that baptism should be a choice made by adults. The Anabaptists based their belief in adult baptism in their interpretation of Scripture and its implications concerning sin. Amish-born scholar John A. Hostetler notes that early Anabaptists “felt that baptizing babies could not be supported by Scriptures. They argued that sin entered the world with a knowledge of good and evil (Gen. 3). Since an infant does not have this knowledge, it cannot have sin.” The descendants of the early Anabaptists, the Old Order Amish and other groups, feel that baptism is unneccessary for the removal of sin. Adult baptism has remained a key defining characteristic for the Amish and other groups who stemmed off from the early Anabaptist movement. Amish feel the decision should be an adult commitment, made by the individual to God, together with the church body. Candidates promise to honor Christian values and to follow the guidelines—or Ordnung—of the individual church district. This solemn vow is taken for life; breaking rules of the Ordnung can result in excommunication and shunning. Amish feel that living by a set of rules is important to achieving a strong Christian faith. Without such rules, membership in the Amish church would be meaningless and the church itself would be weakened or even cease to exist. Why do Amish choose to be baptized? Amish choose to be baptized for reasons of spiritual conviction, believing that Amish Christianity is the best spiritual path for themselves as individuals. Other influences can factor into the decision as well. To be married in the Amish church, both parties must be members, making baptism is a prerequisite for marriage. Peer pressure, as in any other sphere of life, plays a role here too—one may be encouraged to join by the prospect of one’s friends joining. Parents exert some influence as well. Most Amish parents, concerned with the welfare of their childrens’ souls, hope that they choose baptism in the Amish church. Many Amish feel that Amish church membership is not the only way to salvation, however. Numerous Amish families include sons and daughters who have made the choice not to be baptized. 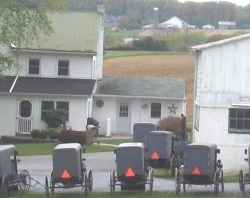 At the same time, having many or all of one’s children baptized in the church is also a status marker among Amish. Amish parents may exert varying degrees of influence upon their children. Some may be more direct about their desire to see their children join the church. Others will simply seek to model good behaviors, or may encourage their children in Christian ways, but refrain from applying too much pressure to join the Amish church itself. As with any familial relationship, experiences may vary. What is the Amish baptismal ceremony like? Candidates for baptism are considered twice yearly, in the fall and spring. Amish baptismal candidates are typically between ages 18-22, but sometimes as young as 16 or as old as the late 20’s. Candidates will attend classes for baptism, consisting of nine meetings with church leadership, over an 18-week period leading up to the baptismal ceremony. Instructional classes take place during the first 30-40 minutes of church service, while the rest of the congregation sings from the Ausbund. During the meetings, the ministry reviews two articles of the Dordrect Confession, a founding document of Amish belief, as well as the church’s individual Ordnung. The day before baptism, there is a special session at which candidates have a final opportunity to change their minds. During the ceremony itself (which takes place after the two sermons of a standard church service) the candidate kneels and the bishop asks questions about the individual’s commitment to living a Christian life and to the church. Candidates are asked to renounce the devil and the world, to commit to Christ, and to accept the Ordnung of the church district. Male candidates know they are also committing to serve in the church ministry if the lot should fall on them in future. The deacon then pours water through the bishop’s hands over the individual’s head. He or she stands to join the rest of the congregation, and is given a holy kiss by the bishop (if male) or by his wife (if female). 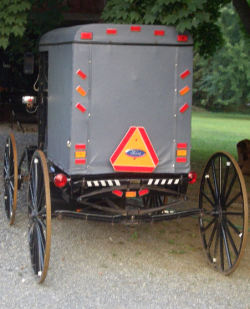 The individual is now a full-fledged member of the Amish church, with all the rights and responsibilities that entails. 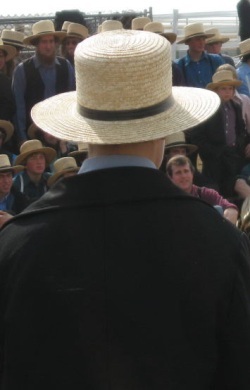 How many youth choose to join the Amish church? Despite what may seem like a difficult lifestyle in outsider’s eyes, high numbers of Amish youth choose to join the Amish church. Percentages may vary by the particular Amish affiliation, but typically 85-90% of Amish youth opt for baptism. These numbers have even been recorded as high as 95% or more, as in the case of the Andy Weaver Amish affiliation in Holmes County, Ohio. Amish youth are attracted to the Amish church by the promise of stability, community, family, and of course, religious conviction. Being a member of the Amish church means giving up a lot of the outside world’s enticements, from some technology to formal education to certain career paths. But in exchange, an Amish person receives the strength of community, the security of knowing one’s place in a social structure, and a web of spiritual and moral support in trying times. Baptism into the Amish church is a choice with trade-offs but with many rewards as well. 3 responses to When do Amish get baptized? For more information, also see: “Amish Wannabe?” at www.BrendaNixonOnAmish.blogspot.com. This post explains some of the requirements for Amish Church membership, which occurs simultaneous with baptism. Christine, baptisms are done in the Name of the Father, the Son, and the Holy Ghost. Leave a reply to When do Amish get baptized?